Over the last decade, emergency preparedness, disaster risk reduction and the humanitarian community’s response to disasters has become a growth industry, with many new actors entering the field and old ones renewing, strengthening or adapting their involvement. This has not always been the case. For many years, relatively few health sector agencies, organizations and individuals were involved in disaster preparedness, mitigation and response. In fact, the term ‘disaster risk reduction’ had not yet become commonplace. However, the situation has changed dramatically, making it imperative to step up efforts to reach out to and work with a wide variety of international development partners and humanitarian agencies. This requires proactive collaboration with external partners, ranging from regional disaster management bodies, to financing agencies, to UN agencies and other international bodies. The health sector in Latin America and the Caribbean (and indeed worldwide) is now able to explore new approaches and initiatives through partnerships and alliances with a wide array of actors. An increased awareness of disaster risk reduction, thanks in part to the adoption of the Hyogo Framework of Action. The United Nations designated the decade of the 1990s as the International Decade for Natural Disaster Reduction and, as the decade drew to a close, the U.N. Office for Disaster Risk Reduction was created in 2000. As a result, political and public awareness of the socioeconomic cost of disasters rose dramatically. This culminated with the adoption of the Hyogo Framework for Action (HFA) at the World Conference on Disaster Reduction in January 2005. (The catastrophic impact of the tsunami of December 2004, which occurred just a few weeks before this global conference, helped focused world attention on these important issues). Overlapping priorities and actions related to relief, recovery and reconstruction: The phases of the disaster cycle form part of a continuum. Following the impact, recovery and reconstruction are beginning immediately. Increasingly, the World Bank, the Inter-American Development Bank and other international financial institutions are ready to begin the recovery process soon after the disaster impact – concurrently with emergency response. Response actors and coordinators must take this into account. Humanitarian actors should consider the developmental nature of recovery activities and take advice from agencies that specialize in recovery and reconstruction; risk management and reduction should be components of any recovery process. Redefinition of what constitutes a disaster and/or an emergency. For decades, the term ‘disaster’ most often referred to a ‘natural’ event such as an earthquake or hurricane. 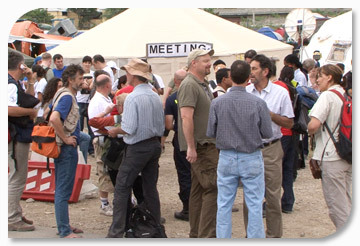 Today, there are many other emergencies or health crises that overwhelm the ability of a country to cope—public health events of international concern, such as pandemics, biological, chemical or radiological accidents, civil strife that results in the displacement of large segments of the population, with the consequent public health problems or acts of terrorism. Each type of emergency brings to the table a wide variety of actors. The changing role of international financial institutions, which increasingly are involved in providing technical as well as post-disaster financial support for the recovery and reconstruction activities mentioned above. Some IFIS are making a sustained investment in disaster preparedness and risk reduction in the hope of preventing future or recurring disasters. The Global Facility for Disaster Reduction and Recovery (see next section on multisector partners) is an example of this changing role. The revised International Health Regulations (IHR): Since 2007, countries worldwide are following the revised International Health Regulations. This legally-binding agreement contributes to global public health security by providing a new framework for coordinating the management of events that may constitute a public health emergency of international concern. The IHR will improve the capacity of all countries to detect, assess, notify and respond to public health threats. Read more about what the International Health Regulations mean for disaster managers. The United Nations Humanitarian Reform: the U.N. Inter-Agency Standing Committee (IASC) is the primary mechanism for inter-agency coordination of humanitarian assistance. The IASC, composed of UN and other agencies, has changed the way humanitarian assistance is coordinated and delivered. The UN Humanitarian Reform has been undertaken to improve the effectiveness of the humanitarian response to emergencies and disasters worldwide and is discussed later in this chapter. Given these factors, the increasing importance of partnerships around issues of disaster risk reduction and health is widely recognized, as is the need for strong coordination, particularly in the fast-moving humanitarian response context. Better and more open communication among all actors will help ensure that efforts are not duplicated, that gaps in assistance are minimized and that inappropriate demands are not placed on national partners, who already function with limited resources. This chapter will explore the rationale for establishing partnerships and alliances, with the purpose of achieving the greatest impact for the health sector in disaster risk reduction and humanitarian response. It will explore some of the key actors (national, regional and international) now involved in this field and examine the UN Humanitarian Reform’s impact on the management of disasters and emergencies. This section will also touch on the issue of international emergency relief assistance in the aftermath of disasters, including common principles, standards and guidelines and look at several existing alliances to improve how aid is being delivered.